Ready PCR Mix is now available in lyophilized format to enhance the stability of AMRESCO’s most popular PCR master mix containing EZ-Vision® DNA dye. Efficiency, quality and safety are fundamental to AMRESCO’s product design as more life scientists seek products that simplify bench work while reducing hazardous chemical exposure. AMRESCO’s Ready PCR Mix, 2X is a unique master mix growing in popularity by adhering to these fundamentals. Now AMRESCO introduces Lyophilized Ready PCR Mix, 2X, which offers greater stability and convenient storage and shipping at ambient temperature. 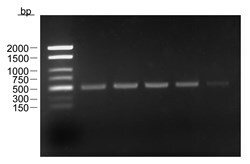 Lyophilized Ready PCR Mix, 2X combines the efficiency of a complete PCR master mix with the simplicity of direct-to-gel loading and immediate amplicon detection after electrophoresis. This unique mix contains AMRESCO’s high fidelity Extender™ DNA Polymerase Blend, reaction buffer, dNTPs, electrophoresis tracking dye and non-mutagenic EZ-Vision® DNA dye. The lyophilized formulation allows room temperature storage until dissolution in water. Optimized for PCR-to-gel loading and immediate DNA visualization, Lyophilized Ready PCR Mix is the ultimate convenient master mix, requiring only the addition of template DNA and primers. PCR reactions can be quickly assembled with a significant reduction in sample handling and chance for contamination. The magenta tracking dye in the mix allows an aliquot of the PCR reaction to be directly loaded and separated on an agarose gel following amplification. After electrophoresis, PCR products are immediately visualized by the included EZ-Vision® DNA dye using standard UV illumination. No post-run staining and destaining steps are necessary. Samples obtained using Lyophilized Ready PCR Mix are compatible with standard downstream applications, such as PCR purification and cloning. For more information about the Lyophilized Ready PCR Mix, 2X or any other AMRESCO products, visit http://www.amresco-inc.com or call 1-800-448-4442. AMRESCO is a manufacturer and supplier of high quality biochemicals and reagents for molecular biology, life sciences, proteomics, histology and clinical areas of research. The company is ISO certified and has QSR compliant facilities to ensure customers receive the highest quality products.